The definition of eosinophilic pneumonia depends on clinical context. 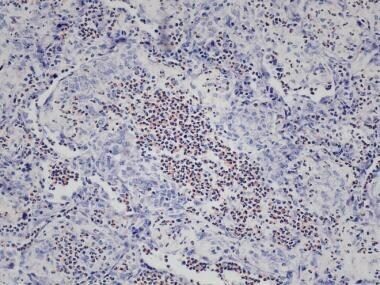 In pathology, eosinophilic pneumonia refers to a histologic pattern of diffuse pulmonary infiltrates that contain prominent numbers of eosinophils. Distinguishing the histologic pattern of eosinophilic pneumonia from clinical syndromes that also contain the term eosinophilic pneumonia (eg, chronic eosinophilic pneumonia, tropical pulmonary eosinophilia, simple eosinophilic pneumonia, acute eosinophilic pneumonia) is important. Histologic areas of eosinophilic pneumonia are characteristic of biopsies from patients with all these syndromes. Nonetheless, the syndromes themselves are diagnosed based on the clinical features in conjunction with other laboratory tests, including biopsies. In this context, identification of eosinophilic pneumonia in lung biopsies may be helpful in the diagnosis and classification of these syndromes when the clinical features are atypical. Biopsies may also provide further information of potential etiologies. Pulmonary eosinophilic syndromes are rare, and the exact incidence and prevalence are unknown. Epidemiologic features differ depending on the clinical syndrome and etiology. Little information is available regarding the prevalence and incidence of eosinophilic reactions to drugs or as a secondary histologic manifestation of pulmonary infection, parasitic infection (eg, Löffler syndrome, simple eosinophilic pneumonia), or neoplasia or as a component of Churg-Strauss syndrome. The etiology of eosinophilic pneumonia varies according to the presenting clinical syndrome. Etiologies overlap but have different frequencies of association. The syndrome of chronic eosinophilic pneumonia is often idiopathic but may occur in as a manifestation of a pulmonary drug reaction [13, 14] or in association with fungal, parasitic, or bacterial infection, [15, 16, 17, 18, 19] underlying connective tissue disease,  or malignancy. Drug reactions are a particularly common cause of pulmonary eosinophilic infiltrates with hundreds of cases reported. In a review, Allen et al provided a comprehensive list of drugs that may cause pulmonary eosinophilia. However, new agents are reported each year. Causes of chronic eosinophilic pneumonia are listed below. The syndrome of acute eosinophilic pneumonia is also often idiopathic but may also occur as a manifestation of a drug reaction, underlying infection with bacteria, viruses or fungi, or as a result of toxic inhalation. [8, 24, 25, 26, 22, 27, 28, 29, 30, 31, 32] Causes of acute eosinophilic pneumonia are listed below. As noted above, pulmonary drug reactions are a common secondary cause of eosinophilic pneumonia. In some disorders, eosinophilic pneumonia may occur as one component of a spectrum of pathologic findings. These disorders include allergic bronchopulmonary aspergillosis, Churg-Strauss syndrome, and infection (bacterial, fungal, parasitic). Distinguishing features of these disorders are discussed in more detail in the section on differential diagnosis. Clinical syndromes are largely defined by the clinical and radiographic features accompanied, when indicated, by consistent pathologic findings on biopsy. Chronic eosinophilic pneumonia in a 64 year old female. High resolution CT scan shows peripheral areas of airspace consolidation (large arrows) and ground glass attenuation (Reproduced with permission from Johkoh T, et al. Radiology 2000;216:773-780. Copyright 2000©RSNA. All rights reserved). Chronic eosinophilic pneumonia in a 59 yea r old non smoking male. 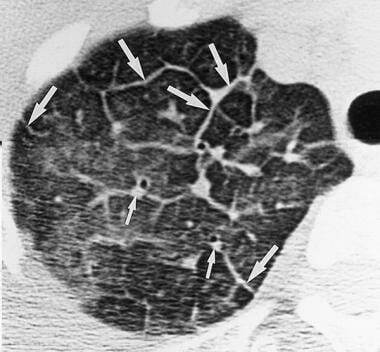 High resolution CT scan shows bilateral ground glass infiltrates more prominent peripherally (arrows). Chest radiographs show diffuse bilateral infiltrates. High-resolution CT scanning shows diffuse areas of ground-glass attenuation, widening of interlobular septa, nodules, and pleural effusion. [56, 57] See the image below. Symptoms of simple eosinophilic pneumonia (Löffler syndrome) are usually mild and self-limited. 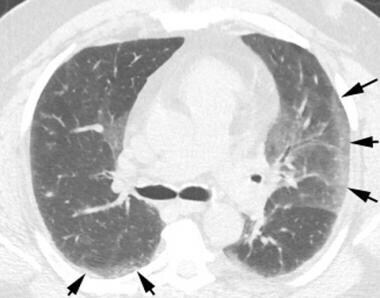 [63, 57] Transient pulmonary infiltrates are present on chest radiography but usually resolve in less than one month. High-resolution CT scanning shows transitory areas of ground-glass attenuation and peripheral airspace consolidation. [56, 57] This condition is only rarely biopsied. See the image below. Histologic findings vary depending on the clinical syndrome and etiology. The description of histologic features is based on wedge or open lung biopsies. However, in clinically typical cases, findings on bronchiolar lavage or transbronchial biopsy are often sufficient to establish the diagnosis. Consistent features: Diffuse infiltrate of eosinophils within alveolar spaces, variable number of macrophages (from few to many), and mixed interstitial infiltrate of eosinophils, lymphocytes. and plasma cells. Biopsies from patients with idiopathic acute eosinophilic pneumonia show areas of eosinophilic pneumonia with superimposed changes of diffuse alveolar damage. Biopsies from patients with tropical pulmonary eosinophilia show areas of eosinophilic pneumonia sometimes accompanied by eosinophilic microabscesses and granulomas progressing over time to fibrosis. Importantly, findings of other disorders, such as aggregates of Langerhans cells in pulmonary Langerhans cell granulomatosis, mucoid impaction or bronchocentric granulomatosis in allergic bronchopulmonary aspergillosis, or allergic granulomas in Churg-Strauss syndrome are absent. Histopathologic features of biopsies from patients with chronic eosinophilic pneumonia, acute eosinophilic pneumonia, simple eosinophilic pneumonia, and tropical pulmonary eosinophilia are discussed in more detail below. In chronic eosinophilic pneumonia, areas of eosinophilic pneumonia consist of intraalveolar infiltrates of eosinophils accompanied by variable numbers of histiocytes, fibrin, and proteinaceous debris. 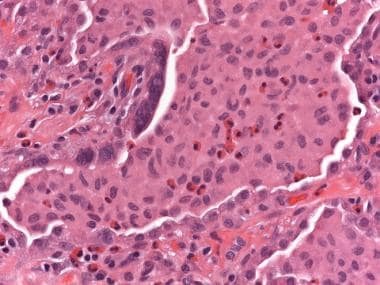 Eosinophilic granules or even Charcot-Leyden granules are sometimes present within histiocytes. Multinucleated histiocytes may occasionally be present. 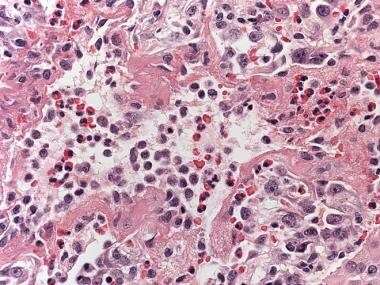 Scattered lymphocytes, plasma cells, and/or neutrophils may be part of the infiltrate but are not conspicuous. A mixed interstitial inflammatory infiltrate consisting of eosinophils, lymphocytes, and plasma cells is often present. Giemsa special stain may be used to highlight eosinophils. [6, 4, 67, 68] See the images below. Chronic eosinophilic pneumonia. Wedge biopsy. Low power view shows diffuse inflammation involving alveolar airspaces. Chronic eosinophilic pneumonia. Wedge biopsy: Higher power shows the inflammatory infiltrate consists of variable accumulations of intraalveolar eosinophils and histiocytes. There is an associated amorphous eosinophilic intraalveolar exudate. Chronic eosinophilic pneumonia. Wedge biopsy. Another view showing the characteristic admixture of eosinophils and histiocytes. Occasional multinucleated histiocytes (arrows) are present. Chronic eosinophilic pneumonia: The intraalveolar and interstitial eosinophils are highlighted on Giemsa special stain. Some cases of chronic eosinophilic pneumonia may show eosinophilic abscesses. Eosinophilic abscesses consist of focal areas of necrotic eosinophils bordered by a poorly formed granulomatous rim. A nonnecrotizing small vessel vasculitis consisting of eosinophils and lymphocytes is often present but is also not conspicuous. 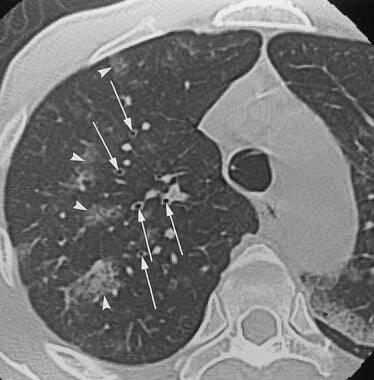 A common, usually focal but nonspecific finding are areas of organizing pneumonia pattern (“BOOP”) consisting of buds of organizing connective tissue within alveolar air spaces. Histiocytes may sometimes be more prominent than eosinophils, probably reflecting the duration of eosinophilic pneumonia or its course of resolution with treatment. An associated amorphous intraalveolar eosinophilic exudate may be present in some cases. 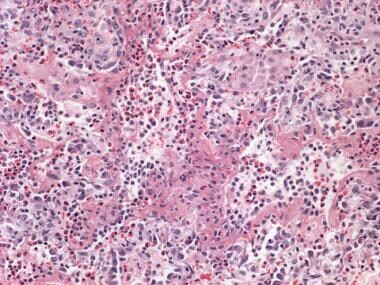 [6, 4, 68] A summary of histologic features in chronic eosinophilic pneumonia is listed above. Chronic eosinophilic pneumonia. Wedge biopsy. A non necrotizing eosinophilic vasculitis is present . There is irregular myxoid intimal thickening of this small artery associated with scattered eosinophils and lymphocytes. Chronic eosinophilic pneumonia. Wedge biopsy. Foci of organizing pneumonia (arrows) were present in this case. Chronic eosinophilic pneumonia: Same patient as above. Low power view showing filling of alveoli by numerous histiocytes. At this power, the histologic findings resemble DIP. Chronic eosinophilic pneumonia: Same patient as above. Higher power shows scattered eosinophils admixed with histiocytes. This case is an example of chronic eosinophilic pneumonia with numerous histiocytes superficially resembling DIP. Biopsies from patients with a clinical syndrome of acute eosinophilic pneumonia also show areas of eosinophilic pneumonia. However, in addition to eosinophilic pneumonia, superimposed features of diffuse alveolar damage are present in these biopsies. Biopsies reveal interstitial and intraalveolar infiltrates of eosinophils as well as hyaline membranes sometimes accompanied by an organizing intraalveolar fibrinous exudate. Varying degrees of organization may be noted, consisting of interstitial fibrosis, edema, and scattered interstitial lymphocytes. Hyperplastic type II pneumocytes are usually line-thickened alveolar septa. 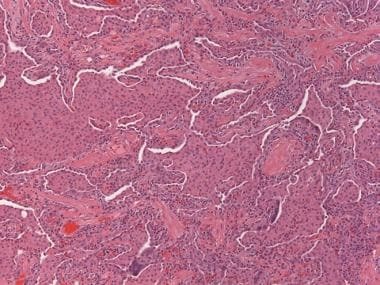 A summary of histologic features in acute eosinophilic pneumonia is listed above. Acute eosinophilic pneumonia: Hyaline membranes line alveolar septa. There is an interstitial and intraalveolar infiltrate of eosinophils. Acute eosinophilc pneumonia. At higher power, the hyaline membranes are composed of fibrin. Eosinophils are present within the alveolar airspace and thickened interstitium. In biopsies from patients with simple eosinophilic pneumonia (Löffler syndrome), the lung shows eosinophilic pneumonia characterized by numerous eosinophils within alveolar spaces and/or the interstitium. However, lung biopsies are rarely obtained, and the diagnosis is usually established clinically with documentation of the eosinophilia in the peripheral blood and identification of the pulmonary infiltrates by chest radiographs. In typical cases of chronic or acute eosinophilic pneumonia, findings on BAL or transbronchial lung biopsy may obviate the need for wedge biopsy. Although eosinophils in BAL fluid are sometimes increased in interstitial lung disease, this increase is usually below 10%. A finding of 20% or greater eosinophils within BAL is almost always associated with an eosinophilic alveolitis. In one study, patients with either acute or chronic eosinophilic pneumonia had a mean percentage of BAL eosinophils of 42% and 35%, respectively. Areas of eosinophilic pneumonia may also sometimes be identified on transbronchial biopsy. Simple eosinophilic pneumonia (Löffler syndrome) is usually mild, self-limited, and requires no treatment. It responds well to steroids when necessary. The prognosis and treatment of patients with secondary forms of eosinophilic pneumonia depends on the underlying cause. Eosinophilic pneumonia occurring as a drug reaction requires identification and withdrawal of the implicated pharmaceutical agent. Eosinophilic pneumonia occurring in the context of allergic bronchopulmonary aspergillosis often results in chronic pulmonary impairment. Eosinophilic pneumonia occurring as part of Churg-Strauss syndrome also responds well to steroids. Marchand E, Reynaud-Gaubert M, Lauque D, Durieu J, Tonnel AB, Cordier JF. Idiopathic chronic eosinophilic pneumonia. A clinical and follow-up study of 62 cases. The Groupe d'Etudes et de Recherche sur les Maladies "Orphelines" Pulmonaires (GERM"O"P). Medicine (Baltimore). 1998 Sep. 77(5):299-312. [Medline]. Thomeer MJ, Costabe U, Rizzato G, Poletti V, Demedts M. Comparison of registries of interstitial lung diseases in three European countries. Eur Respir J Suppl. 2001 Sep. 32:114s-118s. [Medline]. Sveinsson OA, Isaksson HJ, Gudmundsson G. [Chronic eosinophilic pneumonia in Iceland: clinical features, epidemiology and review]. Laeknabladid. 2007 Feb. 93(2):111-6. [Medline]. Jederlinic PJ, Sicilian L, Gaensler EA. Chronic eosinophilic pneumonia. A report of 19 cases and a review of the literature. Medicine (Baltimore). 1988 May. 67(3):154-62. [Medline]. Hayakawa H, Sato A, Toyoshima M, Imokawa S, Taniguchi M. A clinical study of idiopathic eosinophilic pneumonia. Chest. 1994 May. 105(5):1462-6. [Medline]. Carrington CB, Addington WW, Goff AM, Madoff IM, Marks A, Schwaber JR, et al. Chronic eosinophilic pneumonia. N Engl J Med. 1969 Apr 10. 280(15):787-98. [Medline]. Shorr AF, Scoville SL, Cersovsky SB, Shanks GD, Ockenhouse CF, Smoak BL. Acute eosinophilic pneumonia among US Military personnel deployed in or near Iraq. JAMA. 2004 Dec 22. 292(24):2997-3005. [Medline]. Philit F, Etienne-Mastroïanni B, Parrot A, Guérin C, Robert D, Cordier JF. Idiopathic acute eosinophilic pneumonia: a study of 22 patients. Am J Respir Crit Care Med. 2002 Nov 1. 166(9):1235-9. [Medline]. Shintani H, Fujimura M, Ishiura Y, Noto M. A case of cigarette smoking-induced acute eosinophilic pneumonia showing tolerance. Chest. 2000 Jan. 117(1):277-9. [Medline]. Shintani H, Fujimura M, Yasui M, Ueda K, Kameda S, Noto M. Acute eosinophilic pneumonia caused by cigarette smoking. Intern Med. 2000 Jan. 39(1):66-8. [Medline]. Ong RK, Doyle RL. Tropical pulmonary eosinophilia. Chest. 1998 Jun. 113(6):1673-9. [Medline]. Neva FA, Ottesen EA. Tropical (filarial) eosinophilia. N Engl J Med. 1978 May 18. 298(20):1129-31. [Medline]. Trojan A, Meier R, Licht A, Taverna C. Eosinophilic pneumonia after administration of fludarabine for the treatment of non-Hodgkin's lymphoma. Ann Hematol. 2002 Sep. 81(9):535-7. [Medline]. Allen JN. Drug-induced eosinophilic lung disease. Clin Chest Med. 2004 Mar. 25(1):77-88. [Medline]. Warnock ML, Fennessy J, Rippon J. Chronic eosinophilic pneumonia, a manifestation of allergic aspergillosis. Am J Clin Pathol. 1974 Jul. 62(1):73-81. [Medline]. Kawayama T, Fujiki R, Rikimaru T, Aizawa H. Chronic eosinophilic pneumonia associated with Schizophyllum commune. Respirology. 2003 Dec. 8(4):529-31. [Medline]. Lombard CM, Tazelaar HD, Krasne DL. Pulmonary eosinophilia in coccidioidal infections. Chest. 1987 May. 91(5):734-6. [Medline]. Keslin MH, McCoy EL, McCusker JJ, Lutch JS. Corynebacterium pseudotuberculosis. A new cause of infectious and eosinophilic pneumonia. Am J Med. 1979 Aug. 67(2):228-31. [Medline]. Wright JL, Pare PD, Hammond M, Donevan RE. Eosinophilic pneumonia and atypical mycobacterial infection. Am Rev Respir Dis. 1983 Apr. 127(4):497-9. [Medline]. Norman D, Piecyk M, Roberts DH. Eosinophilic pneumonia as an initial manifestation of rheumatoid arthritis. Chest. 2004 Sep. 126(3):993-5. [Medline]. 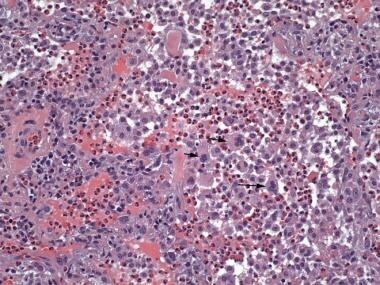 Thiruchelvam JK, Penfold CN, Akhtar S. Chronic eosinophilic pneumonia associated with T-cell lymphoma. Int J Oral Maxillofac Surg. 2002 Feb. 31(1):112-4. [Medline]. Larsen BT, Vaszar LT, Colby TV, Tazelaar HD. Lymphoid Hyperplasia and Eosinophilic Pneumonia as Histologic Manifestations of Amiodarone-induced Lung Toxicity. Am J Surg Pathol. 2012 Apr. 36(4):509-16. [Medline]. Tsapas A, Paletas K, Vlachaki E, Bekiari E, Spanos C, Economidis D. Eosinophilic pneumonia associated with heroin inhalation: a case report. Wien Klin Wochenschr. 2008. 120(5-6):178-80. [Medline]. Matsuno O, Ueno T, Takenaka R, Okubo T, Tokunaga Y, Nureki S, et al. Acute eosinophilic pneumonia caused by Candida albicans. Respir Med. 2007 Jul. 101(7):1609-12. [Medline]. Bouckaert Y, Robert F, Englert Y, De Backer D, De Vuyst P, Delbaere A. Acute eosinophilic pneumonia associated with intramuscular administration of progesterone as luteal phase support after IVF: case report. Hum Reprod. 2004 Aug. 19(8):1806-10. [Medline]. Rether C, Conen A, Grossenbacher M, Albrich WC. A rare cause of pulmonary infiltrates one should be aware of: a case of daptomycin-induced acute eosinophilic pneumonia. Infection. 2011 Dec. 39(6):583-5. [Medline]. Komiya K, Teramoto S, Kawashima M, Kurosaki Y, Shoji S, Hebisawa A. A case of acute eosinophilic pneumonia following short-term passive smoking: an evidence of very high level of urinary cotinine. Allergol Int. 2010 Dec. 59(4):421-3. [Medline]. Miller BA, Gray A, Leblanc TW, Sexton DJ, Martin AR, Slama TG. Acute eosinophilic pneumonia secondary to daptomycin: a report of three cases. Clin Infect Dis. 2010 Jun 1. 50(11):e63-8. [Medline]. Miyazaki E, Sugisaki K, Shigenaga T, Matsumoto T, Kita S, Inobe Y. A case of acute eosinophilic pneumonia caused by inhalation of Trichosporon terrestre. Am J Respir Crit Care Med. 1995 Feb. 151(2 Pt 1):541-3. [Medline]. Mayo J, Collazos J, Martínez E, Díaz F. Acute eosinophilic pneumonia in a patient infected with the human immunodeficiency virus. Tuber Lung Dis. 1995 Feb. 76(1):77-9. [Medline]. Ricker DH, Taylor SR, Gartner JC Jr, Kurland G. Fatal pulmonary aspergillosis presenting as acute eosinophilic pneumonia in a previously healthy child. Chest. 1991 Sep. 100(3):875-7. [Medline]. Brander PE, Tukiainen P. Acute eosinophilic pneumonia in a heroin smoker. Eur Respir J. 1993 May. 6(5):750-2. [Medline]. Toyoshima M, Sato A, Taniguchi M, Imokawa S, Nakazawa K, Hayakawa H. [A case of eosinophilic pneumonia caused by inhalation of nickel dusts]. Nihon Kyobu Shikkan Gakkai Zasshi. 1994 May. 32(5):480-4. [Medline]. Rom WN, Weiden M, Garcia R, Yie TA, Vathesatogkit P, Tse DB, et al. Acute eosinophilic pneumonia in a New York City firefighter exposed to World Trade Center dust. Am J Respir Crit Care Med. 2002 Sep 15. 166(6):797-800. [Medline]. Takamizawa A, Amari T, Kubo K. [A case of acute eosinophilic pneumonia induced by inhalation of acetylene]. Nihon Kokyuki Gakkai Zasshi. 2000 Dec. 38(12):947-51. [Medline]. Kelly KJ, Ruffing R. Acute eosinophilic pneumonia following intentional inhalation of Scotchguard. Ann Allergy. 1993 Oct. 71(4):358-61. [Medline]. Hirai K, Yamazaki Y, Okada K, Furuta S, Kubo K. Acute eosinophilic pneumonia associated with smoke from fireworks. Intern Med. 2000 May. 39(5):401-3. [Medline]. Salerno SM, Strong JS, Roth BJ, Sakata V. Eosinophilic pneumonia and respiratory failure associated with a trazodone overdose. Am J Respir Crit Care Med. 1995 Dec. 152(6 Pt 1):2170-2. [Medline]. Andreu V, Bataller R, Caballería J, Rodés J. Acute eosinophilic pneumonia associated with ranitidine. J Clin Gastroenterol. 1996 Sep. 23(2):160-2. [Medline]. Martinez BM, Domingo P. Acute eosinophilic pneumonia associated with tenidap. BMJ. 1997 Feb 1. 314(7077):349. [Medline]. Barnés MT, Bascuñana J, García B, Alvarez-Sala JL. Acute eosinophilic pneumonia associated with antidepressant agents. Pharm World Sci. 1999 Oct. 21(5):241-2. [Medline]. Kurai J, Chikumi H, Kodani M, Sako T, Watanabe M, Miyata M. Acute eosinophilic pneumonia caused by calcium stearate, an additive agent for an oral antihistaminic medication. Intern Med. 2006. 45(17):1011-6. [Medline]. Seebach J, Speich R, Fehr J, Tuchschmid P, Russi E. GM-CSF-induced acute eosinophilic pneumonia. Br J Haematol. 1995 Aug. 90(4):963-5. [Medline]. Dupon M, Malou M, Rogues AM, Lacut JY. Acute eosinophilic pneumonia induced by inhaled pentamidine isethionate. BMJ. 1993 Jan 9. 306(6870):109. [Medline]. [Full Text]. Kim YH, Mishima M, Yoshizawa A. Gemcitabine-induced acute eosinophilic pneumonia. J Thorac Oncol. 2010 Aug. 5(8):1308-9. [Medline]. McCormick M, Nelson T. Cocaine-induced fatal acute eosinophilic pneumonia: a case report. WMJ. 2007 Apr. 106(2):92-5. [Medline]. Strumpf IJ, Drucker RD, Anders KH, Cohen S, Fajolu O. Acute eosinophilic pulmonary disease associated with the ingestion of L-tryptophan-containing products. Chest. 1991 Jan. 99(1):8-13. [Medline]. Glazer CS, Cohen LB, Schwarz MI. Acute eosinophilic pneumonia in AIDS. Chest. 2001 Nov. 120(5):1732-5. [Medline]. Orikasa K, Namima T, Ota S, Miura M, Hama H, Kimura N. Acute eosinophilic pneumonia associated with intravesical bacillus Calmette-Guérin therapy of carcinoma in situ of the bladder. Int J Urol. 2003 Nov. 10(11):622-4. [Medline]. Roig J, Romeu J, Riera C, Texido A, Domingo C, Morera J. Acute eosinophilic pneumonia due to toxocariasis with bronchoalveolar lavage findings. Chest. 1992 Jul. 102(1):294-6. [Medline]. Jhun BW, Kim SJ, Kim K, Lee JE, Hong DJ. Clinical implications of correlation between peripheral eosinophil count and serum levels of IL-5 and tryptase in acute eosinophilic pneumonia. Respir Med. 2014 Nov. 108(11):1655-62. [Medline]. Te Booij M, de Jong E, Bovenschen HJ. Löffler syndrome caused by extensive cutaneous larva migrans: a case report and review of the literature. Dermatol Online J. 2010. 16(10):2. [Medline]. Cottin V, Cordier JF. Eosinophilic pneumonias. Allergy. 2005 Jul. 60(7):841-57. [Medline]. Enright T, Chua S, Lim DT. Pulmonary eosinophilic syndromes. Ann Allergy. 1989 Apr. 62(4):277-83. [Medline]. Rocha A, Dreyer G, Poindexter RW, Ottesen EA. Syndrome resembling tropical pulmonary eosinophilia but of non-filarial aetiology: serological findings with filarial antigens. Trans R Soc Trop Med Hyg. 1995 Sep-Oct. 89(5):573-5. [Medline]. Johkoh T, Müller NL, Akira M, Ichikado K, Suga M, Ando M. Eosinophilic lung diseases: diagnostic accuracy of thin-section CT in 111 patients. Radiology. 2000 Sep. 216(3):773-80. [Medline]. Jeong YJ, Kim KI, Seo IJ, Lee CH, Lee KN, Kim KN. Eosinophilic lung diseases: a clinical, radiologic, and pathologic overview. Radiographics. 2007 May-Jun. 27(3):617-37; discussion 637-9. [Medline]. Allen JN, Pacht ER, Gadek JE, Davis WB. Acute eosinophilic pneumonia as a reversible cause of noninfectious respiratory failure. N Engl J Med. 1989 Aug 31. 321(9):569-74. [Medline]. Pope-Harman AL, Davis WB, Allen ED, Christoforidis AJ, Allen JN. Acute eosinophilic pneumonia. A summary of 15 cases and review of the literature. Medicine (Baltimore). 1996 Nov. 75(6):334-42. [Medline]. King MA, Pope-Harman AL, Allen JN, Christoforidis GA, Christoforidis AJ. 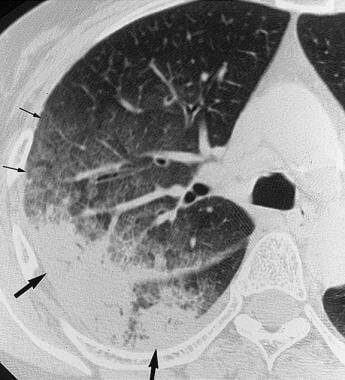 Acute eosinophilic pneumonia: radiologic and clinical features. Radiology. 1997 Jun. 203(3):715-9. [Medline]. Allen J. Acute eosinophilic pneumonia. Semin Respir Crit Care Med. 2006 Apr. 27(2):142-7. [Medline]. Badesch DB, King TE Jr, Schwarz MI. Acute eosinophilic pneumonia: a hypersensitivity phenomenon?. Am Rev Respir Dis. 1989 Jan. 139(1):249-52. [Medline]. Allen JN, Davis WB. Eosinophilic lung diseases. Am J Respir Crit Care Med. 1994 Nov. 150(5 Pt 1):1423-38. [Medline]. Gopinathan VP. Tropical pulmonary eosinophilia. A clinical study. Med J Aust. 1983 Jan 22. 1(2):69-72. [Medline]. Khoo FY, Danaraj TJ. The roentgenographic appearance of eosinophilic lung (tropical eosinophilia). Am J Roentgenol Radium Ther Nucl Med. 1960 Feb. 83:251-9. [Medline]. Sandhu M, Mukhopadhyay S, Sharma SK. Tropical pulmonary eosinophilia: a comparative evaluation of plain chest radiography and computed tomography. Australas Radiol. 1996 Feb. 40(1):32-7. [Medline]. Fox B, Seed WA. Chronic eosinophilic pneumonia. Thorax. 1980 Aug. 35(8):570-80. [Medline]. Liebow AA, Carrington CB. The eosinophilic pneumonias. Medicine (Baltimore). 1969 Jul. 48(4):251-85. [Medline]. Tazelaar HD, Linz LJ, Colby TV, Myers JL, Limper AH. 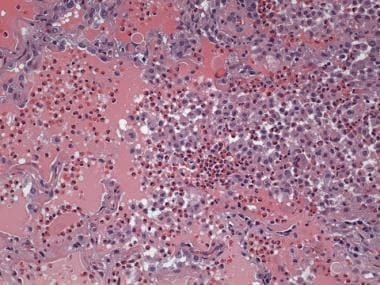 Acute eosinophilic pneumonia: histopathologic findings in nine patients. Am J Respir Crit Care Med. 1997 Jan. 155(1):296-302. [Medline]. Webb JK, Job CK, Gault EW. Tropical eosinophilia: demonstration of microfilariae in lung, liver, and lymphnodes. Lancet. 1960 Apr 16. 1(7129):835-42. [Medline]. Pesci A, Bertorelli G, Manganelli P, Mori PA, Strinati F, Marangio E. Bronchoalveolar lavage in chronic eosinophilic pneumonia. Analysis of six cases in comparison with other interstitial lung diseases. Respiration. 1988. 54 Suppl 1:16-22. [Medline]. Allen JN, Davis WB, Pacht ER. Diagnostic significance of increased bronchoalveolar lavage fluid eosinophils. Am Rev Respir Dis. 1990 Sep. 142(3):642-7. [Medline]. Katzenstein A, Askin F. Immunologic Lung Disease. Surgical pathology of non-neoplastic lung disease. 4. Philadelphia, PA: Elsevier, Inc.; 2006. 151-186. Travis WD, Borok Z, Roum JH, Zhang J, Feuerstein I, Ferrans VJ. 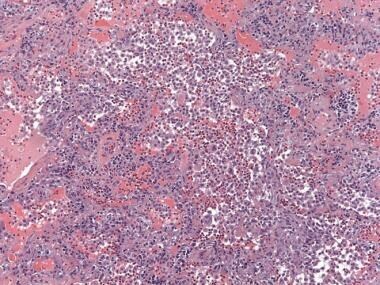 Pulmonary Langerhans cell granulomatosis (histiocytosis X). A clinicopathologic study of 48 cases. Am J Surg Pathol. 1993 Oct. 17(10):971-86. [Medline]. Butland RJ, Coulson IH. Pulmonary eosinophilia associated with cutaneous larva migrans. Thorax. 1985 Jan. 40(1):76-7. [Medline]. Vijayan VK, Reetha AM, Jawahar MS, Sankaran K, Prabhakar R. Pulmonary eosinophilia in pulmonary tuberculosis. Chest. 1992 Jun. 101(6):1708-9. [Medline]. Dines DE. Chronic eosinophilic pneumonia: a roentgenographic diagnosis. Mayo Clin Proc. 1978 Feb. 53(2):129-30. [Medline]. Allergic bronchopulmonary aspergillosis. Eosinophilic pneumonia occurring in a 59 year old male with allergic bronchopulmonary aspergillosis. There are diffuse intraalveolar and interstitial infiltrates of eosinophils and occasional histiocytes. The histologic findings in this field are identical to those of idiopathic chronic eosinophilic pneumonia. Allergic bronchopulmonary aspergillosis. Same patient as in figure above. 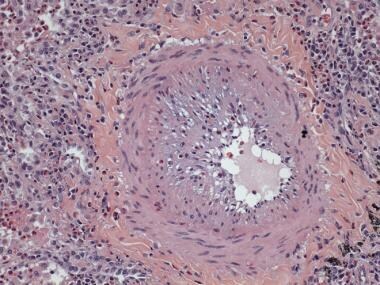 An area of granulomatous inflammation is focally present, possibly centered on a bronchiole. This type of finding should always raise consideration of underlying infection. Allergic bronchopulmonary aspergillosis. Same patient as in the two figures above. Special stain for GMS shows rare fugal hyphae present within areas of eosinophilic inflammation. Churg-Strauss syndrome. 30 year old female with Churg-Strauss syndrome. There are prominent areas of eosinophilic pneumonia present in this wedge biopsy. Churg –Strauss syndrome. Same patient as in figure above. 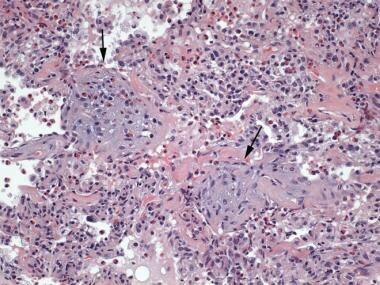 In addition to areas of eosinophilic pneumonia, there are scattered allergic "Churg-Strauss' granulomas (arrows). Churg-Strauss syndrome. Higher power view of allergic granuloma showing a circumscribed collection of epithelioid histiocytes surrounding central eosinophilic necrosis (arrows).